Neal Ramee is a partner in the firm's Education Section. He received his undergraduate degree in philosophy from the University of Virginia and his law degree from the University of North Carolina School of Law, where he was inducted into the Order of the Coif. While in law school, Mr. Ramee served as Managing Editor of the First Amendment Law Review and as an Honors Writing Scholar. Before joining the firm in 2005, he served for two years as a law clerk to Justice Mark Martin at the North Carolina Supreme Court. Mr. Ramee has litigated cases in state and federal court involving the First Amendment, contract and employment disputes, student assignment, the Fair Labor Standards Act, negligence claims, and federal civil rights issues, among other matters. He has published articles and delivered presentations to school officials and school attorneys on diverse topics including the First Amendment, student assignment, cyber-bullying, child custody, student records, internal investigations, and the use of public-private partnerships for school construction. He has also taught a class in legal reasoning and writing as an adjunct faculty member at the University of North Carolina School of Law. Mr. Ramee has served as Secretary/Treasurer of the Education Section of the North Carolina Bar Association and as editor of its publication, Education Law. 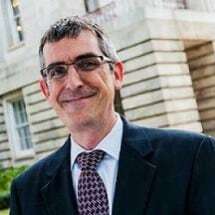 He is a member of the North Carolina Council of School Attorneys, the National Council of School Attorneys, and the American Immigration Law Association. Mr. Ramee is licensed in North Carolina and has been admitted to practice before the federal courts in the Eastern and Middle Districts of North Carolina. His practice is dedicated to representation of public schools and other educational institutions, with a particular focus on the state and federal constitutions, appellate practice, student discipline, student assignment, and immigration issues arising in the public school context.